(Inside Science) -- Exposure to wildfire smoke can send people with asthma rushing to the hospital, and it may also cause violent crime rates to spike, according to new research. Both wildfires and fossil fuel combustion produce fine airborne particulate matter, also known as PM 2.5. It's well established that long-term exposure to PM 2.5 from fossil fuels can harm people's health. But wildfire particles tend to be made of different materials than fossil fuel exhaust, and people's exposure to them is usually more short-term, so the effects could potentially be different, according to Jeffrey Pierce, an atmospheric scientist at Colorado State University in Fort Collins, and graduate student Katelyn O'Dell. To study the effects of wildfire smoke, Pierce, O'Dell, and their colleagues focused on both the national and statewide scales. They reviewed four wildfire season case studies from individual states -- Washington in 2012, Oregon in 2013, and Colorado in 2012 and 2015. Their country-wide analysis used U.S. data from 2006 to 2015. For each analysis, they estimated how much PM 2.5 wildfires were adding to the air over time on a county-by-county basis. To do so, they first estimated combined pollution levels from both wildfires and fossil fuel combustion, using data from on-the-ground air sensors. Then, they used satellite images to determine when each county was exposed to wildfire smoke. By subtracting the amount of particulate matter on a typical, non-smoky day from the amount when the area was inundated by wildfire smoke, the researchers could estimate how much extra pollution wildfires added. 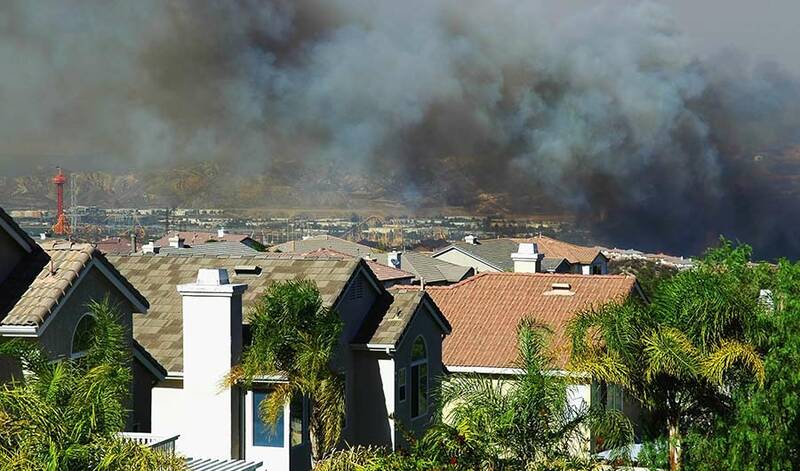 In three of the four case studies, people went to the hospital for asthma significantly more often on days when wildfire smoke was present. In Oregon, the researchers also had data on inhaler refills, and they saw that people filled inhaler prescriptions more often on smoky days. In their country-wide analysis, the researchers found that admissions to intensive care units were significantly higher over the five days following an increase in smoke levels. People across the U.S. also tended to commit more violent crimes (including domestic violence) when there was wildlife smoke in their area, although the reasons for this aren't clear, said O'Dell. There is a well-known link between high temperatures and violent crime, but that can't explain the smoke-crime link because the researchers controlled for temperature in their analysis. They presented the findings last month at the American Geophysical Union meeting in Washington D.C. While particulate air pollution from fossil fuels is declining in the U.S., major wildfires are growing more frequent, and wildfire smoke levels are projected to increase in the western part of the country. For example, California experienced one of the worst wildfire seasons on record this past summer. Californians may well have suffered effects similar to those seen in the study, according to Pierce, although he added that there could also be regional differences due to factors such as how much people use air conditioners. The new findings are important, said O'Dell, in part because the health and crime effects appeared even with relatively low levels of smoke. "It's maybe fairly obvious when you see, like, this massive smoke plume, that breathing that in is probably not good for you," said O'Dell. "But we see these responses even on days of only 10 micrograms [of PM 2.5 per cubic meter], which is something that you might not even be able to see."